The courses have been produced by EDSA partner KTH. 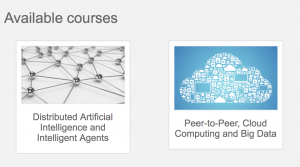 The first course provides knowledge about basic methods and techniques of Distributed AI and agent technology to be applied to data intensive systems. The second one focuses on distributed systems and algorithms specially for fully decentralized systems such as peer-to-peer systems and gossip-based systems. Both courses are available to study for free via the EDSA online courses portal.